Recommend a friend or a family member to the services provided by County Home Care. Meet with our intake coordinator or registered nurse for a consultation on Home Care. County Home Care accepts various payment modes for the convenience of our clients. At County Home Care, we know that everyone needs a little extra assistance sometimes – be it with the day-to-day tasks of living or running errands and going to social events. Perhaps you or your loved one are recovering from surgery or an extended illness and wish to have the peace of mind that comes with having some help available at home. County Home Care provides a unique service that assists our clients and allows them to remain safe and independent in their own homes or apartments. We are committed to providing quality, ethical and professional services. Our employees are carefully screened, trained, bonded, insured, and supervised. They are caring, courteous in nature, committed to care, and eager to help. 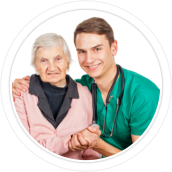 Our screening process is based on hiring only those who we would have in our own home caring for our parents. We treat you like a family member. We are passionate about the services we provide and take pride in our responsiveness and our ability to provide our clients with individual attention. We are not a large national franchise but a small privately owned company that focuses on the well-being of our clients. You deal with real people not a Corporation. Our services are flexible and can be arranged for as little as a few hours a week or as many as 24 hours a day, seven days a week, including holidays. Each individual is unique, with unique interests and homecare needs. At County Home Care, we understand that a perfect match of caregiver and client will provide both with a satisfying relationship. County Home Care is dedicated to helping our clients lead dignified, independent lifestyles in the comfort and safety of their homes by carefully assessing and fully understanding their needs and selectively placing trained personnel to meet their needs.